Tandoori Sweet Potatoes | Naturally. I’ve noticed over the past year or two that the recipes I share on the site are heavily skewed towards vegetarian main dishes with a few desserts and random recipes sprinkled in as I go. One thing I don’t share a ton of is vegetables as side dishes (primarily because when I whip up a vegetable dish, I put enough bulk behind it to make a full meal). 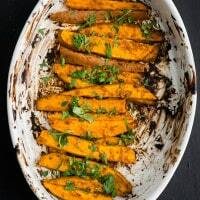 However, this is a recipe I use as a ‘meet in the middle.’ My husband will have this as a side dish and I’ll top a bowl of quinoa/greens with these sweet potatoes (usually followed by a dollop of greek yogurt) to make these sweet potatoes that full meal I desire. These sweet potatoes take a bit of time to cook but if you’re in a bit of a hurry, you could cut the sweet potatoes into smaller sizes or even blanch them just until the sweet potato was beginning to soften (then roast!) I’ll also make a full batch of the tandoori seasoning and use it on other vegetables (or chicken, if that’s your thing) as well! Preheat oven to 400˚. Cut the sweet potato into 3/4″ thick wedges. Toss with greek yogurt and tandoori spices until well coated. Roast for 30 to 45 minutes until sweet potato is browning and tender (this will depend on how thick you cut your sweet potato slices). Serve with a sprinkle of fresh cilantro. I love sweet potato crisps, and this sounds like a good variation – can’t wait t try it! Great sweet potato fry recipe! This looks so simple and delicious! 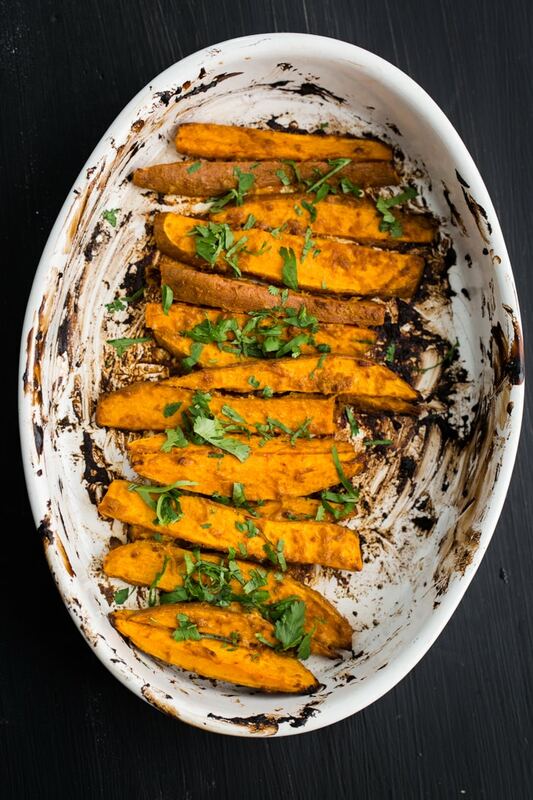 It’s like an original, healthier take on sweet potato fries… I love the idea! I love sweet potato fries so much, they are so easy to make and flavour plus a delicious addition to any meal! I love tandoori! I once had a run-in with tandoori chicken that I’ll never forget, but that’s a story for another day. Love what you did here! I absolutely adore sweet potatoes and are always glad to find new ways to eat them. I have recently discovered your blog and I’m going to try a lot of recipes. Sweet potato fries are my love language!! And tandoori seasoning? Delicious!! Love the idea of making this a meal with quinoa, some greens and Greek yogurt. Yum. Is it possible for sweet potatoes to look glow-y? These are absolutely perfect, can’t wait to try em! These look so awesome! I love tandoori anything but I bet these are delicious. A definite must try! This looks tiptop! 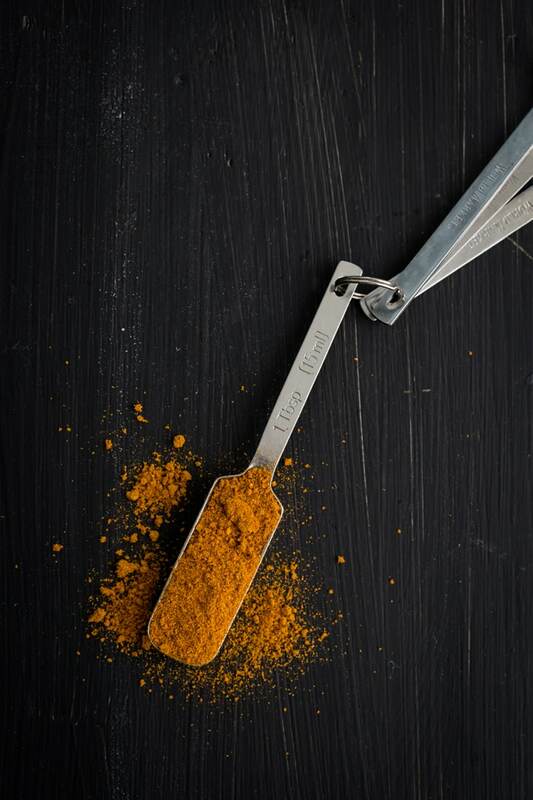 The tandoori looks amazing! These sweet potatoes look amazing. Need to try this recipe. Thanks for sharing.